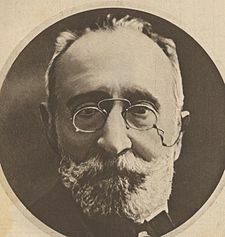 Paolo Boselli (June 8, 1838 - March 10, 1932) was an Italian politician who served as the 34th Prime Minister of Italy during World War I.
Boselli was born in Savona, Liguria. In June 1916 he was a relatively undistinguished center-right politician and one the oldest members of the Italian parliament, when he was appointed Prime Minister, following the collapse of the Salandra government as a result of military defeats. His government fell in October 1917 as a result of the Italian military defeat in the Caporetto.